Note - The Zionist movement developed against the background of events in Palestine/Israel and influenced those events. This account of Zionism is meant to be read together with the brief history of Israel and Palestine. Likewise, the Labor Zionist movement was a major force in the early implementation of Zionism, and therefore the history of Zionism cannot be intelligible without understanding the history of Labor Zionism. 1. An ideology - Zionist ideology holds that the Jews are a people or nation like any other, and should gather together in a single homeland. Zionism was self-consciously the Jewish analogue of Italian and German national liberation movements of the nineteenth century. The term "Zionism" was apparently coined in 1891 by the Austrian publicist Nathan Birnbaum, to describe the new ideology, but it was used retroactively to describe earlier efforts and ideas to return the Jews to their homeland for whatever reasons, and it is applied to Evangelical Christians who want people of the Jewish religion to return to Israel in order to hasten the second coming. "Christian Zionism" is also used to describe any Christian support for Israel. 2. A descriptive term - The term "Zionism" was apparently coined in 1891 by the Austrian publicist Nathan Birnbaum, to describe the new ideology. It is also used to describe anyone who believes Jews should return to their ancient homeland. 3. A political movement - The Zionist movement was founded by Theodor Herzl in 1897, incorporating the ideas of early thinkers as well as the organization built by Hovevei Tziyon ("lovers of Zion"). "Zionism" derives its name from "Zion," (pronounced "Tzyion" in Hebrew) a hill in Jerusalem. The word means "marker" or commemoration. "Shivath Tzion" is one of the traditional terms for the return of Jewish exiles. "Zionism" is not a monolithic ideological movement. It includes, for example, socialist Zionists such as Ber Borochov, religious Zionists such as rabbi Kook, revisionist nationalists such as Jabotinsky and cultural Zionists exemplified by Asher Ginsberg (Achad Haam). Zionist ideas evolved over time and were influenced by circumstances as well as by social and cultural movements popular in Europe at different times, including socialism, nationalism and colonialism, and assumed different "flavors" depending on the country of origin of the thinkers and prevalent contemporary intellectual currents. Accordingly, no single person, publication, quote or pronouncement should be taken as embodying "official" Zionist ideology. Zionism did not spring full blown from a void with the creation of the Zionist movement in 1897. Jews had maintained a connection with Palestine, both actual and spiritual, even after the Bar Kochba revolt in 135, when large numbers of Jews were exiled from Roman Palestine, the remains of their ancient national home. The Jewish community in Palestine revived and, under Muslim rule, is estimated to have numbered as many as 300,000 about 1000 AD, prior to the Crusades. The Crusaders killed most of the Jewish population of Palestine or forced them into exile, so that only about 1,000 families remained after the reconquest of Palestine by Saladin. The Jewish community in Palestine waxed and waned with the vicissitudes of conquest and economic hardship, and invitations by different Turkish rulers to displaced European Jews to settle in Tiberias and Hebron. At different times there were sizeable Jewish communities in Tiberias, Safed, Hebron and Jerusalem, and numbers of Jews living in Nablus and Gaza. A few original Jews remained in the town of Peki'in, families that had lived there continuously since ancient times. In the Diaspora, religion became the medium for preserving Jewish culture and Jewish ties to their ancient land. Jews prayed several times a day for the rebuilding of the temple, celebrated agricultural feasts and called for rain according to the seasons of ancient Israel, even in the farthest reaches of Russia. The ritual plants of Sukkoth were imported from the Holy Land at great expense. From time to time, small numbers of Jews came to settle in Palestine in answer to rabbinical or Messianic calls, or fleeing persecution in Europe. Beginning about 1700, groups of followers led by rabbis reached Palestine from Europe and the Ottoman empire with various programs. For example, Rabbi Yehuda Hehasid and his followers settled in Jerusalem about 1700, but the rabbi died suddenly, and eventually, an Arab mob, angered over unpaid debts, destroyed the synagogue the group had built and banned all European (Ashkenazy) Jews from Jerusalem. Rabbis Luzatto and Ben-Attar led a relatively large immigration about 1740. Other groups and individuals came from Lithuania and Turkey and different countries in Eastern Europe. At no time between the Roman exile and the rise of Zionism was there a movement to settle the holy land that engaged the main body of European or Eastern Jews. The condition of Jews both in Europe and Eastern countries made such a movement unimaginable. Many, however, were attracted to various false Messiahs such as Shabetai Tzvi, who promised to restore Jews to their land. For most Jews, the connection with the ancient homeland and with Jerusalem remained largely cultural and spiritual, and return to the homeland was a hypothetical event that would occur with the coming of the Messiah at an unknown date in the far future. European Jews lived, for the most part in ghettos. They did not get a general education, and did not generally engage in practical trades that might prepare them for living in Palestine. Most of the communities founded by these early settlers met with economic disaster, or were disbanded following earthquakes, anti-Jewish riots or outbreaks of disease. The Jewish communities of Safed, Tiberias, Jerusalem and Hebron were typically destroyed by natural and man-made disasters and repopulated several times, never supporting more than a few thousand persons each at their height. The Jews of Palestine, numbering about 17,000 by the mid-19th century, lived primarily on charity - Halukka donations, with only a very few engaging in crafts trade or productive work. British Zionism - The idea of a Jewish restoration also took the fancy of British intellectuals for religious and practical reasons. It had been championed by protestants since the seventeenth century. The restoration was championed in the 1840s by Lords Shaftesbury and Palmerston, who in addition to religious motivations thought that a Jewish colony in Palestine would help to stabilize and revive the country, Jewish national stirrings were also voiced by novelists and writers such as Lord Byron, Benjamin Disraeli, George Eliot and Walter Scott. ( for a detailed discussion of British Zionism click here ). Role of Sephardic Jews - Through an accident of history, European (Ashkenazy) Jews took the lead in organized Zionism for many years. However, Sephardic (Spanish) Jews and Jews in Arab lands maintained a closer practical tie with the holy land and with the Hebrew language than did Ashkenazy Jews and also influenced and participated in the the Zionist movement from its inception. 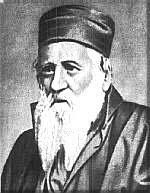 Sarajevo-born Judah ben Solomon Hai Alkalai (1798-1878,) is considered one of the major precursors of modern Zionism. Alkalai believed that return to the land of lsrael was a precondition for the redemption of the Jewish people. Alkalai's ideas greatly influenced his Ashkenazy contemporary, Rabbi Zvi Hirsh Kalischer. Alkalai was also a friend of the grandfather of Theodore Herzl, the founder of modern Zionism. Another Sephardi Jew, David Alkalai, a grand-nephew of Judah Alkalai, founded and led the Zionist movement in Serbia and Yugoslavia., and attended the first Zionist Congress in Basel (1897). The modern formulation of Zionism was divorced from religious aspirations. The 19th century enlightenment allowed the Jews to leave the ghettos of Europe for the first time. Some converted to Christianity and assimilated to surrounding society. Others, exposed to a general education, dropped their religious beliefs, but considered themselves Jews, and understood that others still considered them to be Jews. This suggested a conundrum. If one could be a non-believer and still be a Jew, then "Jew" must be more than just the name of a religion. German racists solved this conundrum by inventing a racial theory, which lacked any real scientific basis. Socialists cited the aberrant class structure of Jewish society and labeled Jews a "caste." Zionists solved the conundrum by declaring that Jews are a people, a fact implicit and explicit in the Jewish biblical and cultural concept of "am Yisrael." The Jews were a people without a country however, and would remain politically powerless as long as they did not have a national home. They would be guests everywhere and at home nowhere, according to Zionist ideology. This homelessness was the cause of the "Jewish Problem," and it could not fail to be exacerbated by the rise of nationalism and nations in the 19th century. This explained why, paradoxically, anti-Jewish sentiment might become more pronounced in "enlightened" Europe than it had been in previous centuries, when nationalism had been less pronounced. Moses Hess, a relatively secular Jew and a socialist, was probably the first to enunciate these ideas in so many words in his book Rome and Jerusalem: The Last National Question, published in 1862, calling for a Jewish national movement similar to the Italian risorgimento nationalist movement. These and similar sentiments were adopted by numerous small groups that formed primarily in Eastern Europe, but also in Britain and in the United States. The "first aliya" - The first groups of immigrants who came to the land of Israel (it had no official name in the Ottoman Empire) with the idea of turning the land into a national home for the Jews are known as the "first Aliya." "Aliya" literally means "going up" and it is a term Jews have used for a long time for coming to the holy land. Beginning in the 1870s, religious and nonreligious Jews established several study groups and societies for purchasing land in Palestine and settling there. In 1870 the Alliance Israelite, an ostensibly non-Zionist organization, founded the Miqveh Yisrael agricultural school near Beit Dagan. In 1882, the BILU (an acronym for "Beyt Ya'akov Lechu Venelcha" - House of Jacob let us go) and Hibbat Tziyon (love of Zion) groups were established. They were inspired by the impetus of the wave of anti-Jewish violence that had swept Russia in 1881. Hibbat Tziyion began as a network of independent underground groups. These and similar groups established a number of early Jewish settlements including Yesod Hamaalah, Rosh Pinna, Gedera, Rishon Le Tziyon, Nes Tziyonna and Rehovot on land purchased from Arab owners with the aid of Jewish philanthropists, chiefly Lord Rothschild. Joel Solomon led a group of orthodox Jews out of Jerusalem to found Petah Tikva in 1878. The settlements were characteristically vineyards and orange orchards. The settlers were mostly religious Jews, though the religious Jewish establishment frowned on Zionism. In 1882, 150 Yemenite Jews also found their way to Palestine. The first Aliya numbered about 25,000 persons, primarily from Eastern Europe. Many of them returned home defeated by disease, poverty and unemployment. Revival of Hebrew - Among the first arrivals of the first Aliya was Eliezer ben Yehuda (Perelman). Inspired by European, particularly Bulgarian nationalism, Ben Yehuda was moved to settle in Palestine. He arrived in 1881 and undertook to revive the Hebrew language. With the help of Nissim Bechar, principal of a school operated by the Alliance Israelite Universelle, Ben Yehuda began teaching Hebrew. Later he founded and published the Hatzvi newspaper, and set up a linguistic council. Ben Yehuda's work was the major force in the revival of Hebrew as a modern language. Leon Pinsker and Hovevei Tziyon - Inspired by the anti-Semitic violence in Russia, Leon Pinsker formulated the modern idea of Zionism in a small pamphlet called Auto-Emancipation, published in 1882. Pinsker believed that anti-Semitism was inevitable as long as Jews were guests in every country and at home nowhere, and wrote that the Jews' only salvation lay in liberating themselves and settling in their own country. Pinsker favored Argentina or other countries as sites for the Jewish homeland. However, Western Jews who might have favored this idea rebuffed him. In his native Russia, however, his ideas were well received, but they were channeled to settlement in Palestine. In 1882, Pinsker was made head of the Hovevei Tzion organization, which united many small and scattered groups, primarily in Russia, into a single organization. Pinsker favored "political Zionism," that is, organization of Jews in Europe and petitioning the great powers for land on which to establish a national home. However, his efforts in this direction were rebuffed by the Russian government. Instead, he directed his energies to the gradual purchase of land and settlement of small groups in Palestine. Early settlers faced innumerable cultural and economic difficulties. In 1800, the ravages of misadministration and war had reduced the population to about 200,000. By the 1880s, the land had recovered somewhat, but it was still poor and disease ridden. The total population was about 450,00. Jerusalem was a small town of 25,000 inhabitants, slightly more than half Jewish. The first settlement of Petah Tikva in 1878 failed and was later refounded. The Ottoman government barely tolerated the settlers, especially those who retained their foreign nationality, and occasionally the government restricted immigration. Settlers who adopted Ottoman nationality were liable for the Turkish draft. Disease, poverty and unemployment caused many to leave. The Dreyfus affair, which developed in France beginning in 1894, made Western European Jews conscious of their national identity, and in particular, affected a young Vienna journalist, Theodor Herzl . His pamphlet Der Judenstaat, The Jewish State, was published in 1896. Herzl's plan for creating a Jewish State, arrived at after contemplating other solutions as well, provided the practical program of Zionism, and led to the first Zionist Congress in Basle, Switzerland, in August, 1897. There had been lesser Zionist political gatherings with the same aims in the years just prior to the Zionist Congress, but they did not attract the attention that Herzl's congress did, and were largely forgotten. The Basle congress marked the foundation of Zionism as a world political movement. In 1902, Herzl published a utopian novel to popularize the Jewish state, Altneuland, (old-new land) a vision complete with monorails and modern industry. The novel concludes, "If you will, it is no legend." Herzl thought that diplomatic activity would be the main method for getting the Jewish homeland. He called for the organized transfer of Jewish communities to the new state. Of the location of the state, Herzl said, "We shall take what is given us, and what is selected by public opinion." Herzl negotiated with the British regarding the possibility of settling the Jews on the island of Cyprus, the Sinai Peninsula, the El Arish region and Uganda. After the Kishinev pogroms, Herzl visited Russia in July 1903. He tried to persuade the Russian government to help the Zionists transfer Jews from Russia to Palestine. At the Sixth Zionist Congress Herzl proposed settlement in Uganda, on offer from the British, as a temporary "night refuge." The idea met with sharp opposition, especially from the same Russian Jews that Herzl had thought to help. Though the congress passed the plan as a gesture of esteem for Herzl, it was not pursued seriously, and the initiative died after the plan was withdrawn. In his quest for a political solution, Herzl met with the king of Italy, who was encouraging, and with the Pope, who expressed opposition. A small group, the Jewish Territorial Organization ("Territorial Zionists") led by Israel Zangwill, split with the Zionist movement in 1905, and attempted to establish a Jewish homeland wherever possible. The organization was dissolved in 1925. The insistence of Eastern European Jews on Palestine as the Jewish homeland, coupled with the failure of alternatives, maintained the focus of the Zionist movement on Palestine. The "political Zionism" approach originally tried by Montefiore, Pinsker and Herzl, which attempted to obtain a Jewish homeland from colonial powers, failed to attain results at least initially. Meanwhile, however, practical settlement efforts gradually increased the Jewish population of Palestine from about 25,000 in 1882 to approximately 85,000 to 100,000 just prior to World War I. Labor Zionism - Detail of photo showing delegates to the fourth meeting of the Hapoel Hatzair, about 1909. Click here for full photo and more about labor Zionism and socialist Zionism. The new immigrants arrived with the ideals of socialist Zionism, but reality was not favorable to implementing those ideas. The Zionist movement attempted to find them work. but the new immigrants , who had no training in agriculture and poor physical stamina, were unable to compete with Arab peasants. Arabs certainly would not hire Jewish workers, who could not work well and could not speak Arabic. Arab labor was also preferred by the plantation and vineyard owners of the first Aliya. Arabs were experienced and hard workers, and were able to work for much lower wages because they were often members of an extended family that made its main income from sharecropping. The plantation owners had also developed a superior colonialist mentality which suited the hiring of "natives," and clashed with the egalitarian ideas and social demands of the newly arrived socialists. "How can Jews, who demand emancipation in Russia, rob rights and act selfishly toward other workers upon coming to Eretz Israel? If it is possible for many a people to hide fairness and justice behind cannon smoke, how and behind what shall we hide fairness and justice? We should absolutely not deceive ourselves with terrible visions. We shall never possess cannons, even if the goyim shall bear arms against one another for ever. Therefore, we cannot but settle in our land fairly and justly, to live and let live. " But labour is the only force which binds man to the soil… it is the basic energy for the creation of national culture. This is what we do not have, but we are not aware of missing it. We are a people without a country, without a national living language, without a national culture. We seem to think that if we have no labour it does not matter - let Ivan, John or Mustafa do the work, while we busy ourselves with producing a culture, with creating national values and with enthroning absolute justice in the world. The boycott of Arab labor, only partly successful, was carried out reluctantly as a matter of necessity, and because the establishment of Jews as a class of colonial plantation owners seemed worse than the alternative. The discriminatory program of "conquest of labor" also provoked bitterness among some Arabs, particularly watchmen who lost their jobs to Jews. In the main however, the "conquest of labor" movement was initially unsuccessful, nor could it have much real influence on the economic prospects of Arabs. Only a few thousand Jewish workers were involved. Gershon Shafir (Land, Labor and the Origins of the Israeli-Palestinian Conflict, 1882–1914, University of California Press, 1996) estimates that about 10,000 such workers passed through Palestine in the second Aliya, many leaving in discouragement. Other sources claim there were about 3,000 workers out of approximately 33,000 who came to Palestine in the second Aliya. Because of the wage differential and because of the expertise of Arab workers, Arab labor continued to find employment in Jewish settlements. It was only with the massive Jewish immigration of the 1930s, coupled with Arab unrest and sabotage attempts, that Jewish workers began to replace Arab workers in most of the Jewish economy. Of course, few Jews worked in the Arab economy. The kibbutz collective settlements were started as a practical method of settling Jewish laborers on the land and overcoming the preferences of plantation owners for Arab labor. A small group of Jewish immigrants was settled in an economic cooperative in Sejera, later founding Kibbutz Degania in 1909. The arrangement, originally thought to be temporary, proved to be practical, as well as suited to the socialist ideals of the new settlers. It soon inspired several other kibbutzim (collective farms). The kibbutz movement was to become the backbone of Labor Zionism in Palestine, and eventually provided political and military leadership. Kibbutzim provided ideal places for hiding arms from the British and recruiting and training troops, as well as for organizing local defense and guarding borders. The Zionist movement did not give up efforts to find a political solution. The political Zionism and practical settlement approaches were merged into "Synthetic Zionism" advocated by Chaim Weizmann . The efforts ultimately bore fruit in the Balfour Declaration, a promise by Britain to further efforts for a Jewish national home in Palestine. and in the League of Nations Mandate, which give international sanction to the Jewish national home. Weizmann became head of the Zionist organization and later was the first President of Israel. When Zionism had its first beginnings, in the early 19th century, there were about 200,000 Arabs living in all of the land, mostly concentrated in the countryside of the West Bank and Galilee, and mostly lacking in national sentiment. Palestine was, in Western eyes, a country without a nation, as Lord Shaftesbury wrote. Early proto-Zionists did not trouble themselves at all about the existing inhabitants. Many were heavy influenced by utopianism. In the best 19th century tradition, they were creating a Jewish utopia, where an ancient people would be revived. They envisioned a land without strife, where all national and economic problems would be solved by good will, enlightened and progressive policies and technological know-how. Herzl's Altneuland was in in fact just such a utopia. In reality, Jewish population grew, but Arab population grew more rapidly. By 1914, there were over 500,000 Arabs in Palestine, but only about 80,000 to 100,000 Jews. At the same time, Zionist pronouncements and outlook were often frankly colonialist, especially when addressing leaders of foreign powers. The plantations sponsored by Baron Rothschild were modeled on plantation settlement in Algeria and other colonies. Colonialism was fashionable and "progressive," and early Zionist leaders saw nothing wrong in assimilating this idea to Zionism along with other modern ideas such as socialism, utopianism and nationalism. Later Zionists were heavily influenced by socialism and embarrassed at the colonialist aspects of the Zionist project. They were also aware, of course, that Palestine was already occupied by Arabs. Many however, including the young David Ben-Gurion, who headed the Executive committee of the Zionist Yishuv (Jewish community) in Palestine and was later the first Prime Minister of Israel, initially thought that the Arabs could only benefit from Jewish immigration and would welcome it. Others, such as Eliezer ben Yehuda, frankly envisioned removal of the Arabs from Palestine. Ahad Ha'am, believed that the Jews would need to first build a strong Jewish culture abroad, and that this culture and awareness would then make the dream of a Jewish homeland possible. The Jewish state, he felt should be a cultural center for Jews of the Diaspora. Nevertheless he was an enthusiastic supporter of Zionism and wrote an article eulogizing Leon Pinsker in glowing terms. Two important phenomena of the same nature but opposed, are emerging... They are the awakening of the Arab nation and the latent effort of the Jews to reconstitute on a very large scale the ancient kingdom of Israel. These movements are destined to fight each other continually until one of them wins. We are not xenophobes; we welcome all strangers. We are not anti-Semites; we value the economic superiority of the Jews. But no nation, no government, could open its arms to groups... aiming to take Palestine from us. "We will push the Zionists into the sea or they will push us into the desert"
The matter is not ... an issue between the Jewish people and the Arab inhabitants of Palestine, but between the Jewish people and the Arab people. The latter, numbering 25 million, has [territory equivalent to] half of Europe, while the Jewish people, numbering ten million and wandering the earth, hasn't got a stone...Will the Arab people stand opposed? Will it resist? [Will it insist] that...they...shall have it [all] for ever and ever, while he who has nothing shall forever have nothing? But not everybody sees that there is no solution to this question. No solution! There is a gulf; and nothing can bridge it.... I do not know what Arab will agree that Palestine should belong to the Jews...We. as a nation,. want this country to be ours; the Arabs, as a nation, want this country to be theirs. ...look upon Palestine with the same instinctive love and true fervor that any Aztec looked upon his Mexico or any Sioux looked upon his prairie. To think that the Arabs will voluntarily consent to the realization of Zionism in return for the cultural and economic benefits we can bestow on them is infantile. Jabotinsky, was initially against expulsion of the Arabs, which he was "prepared to swear, for us and our descendants, that we will never [do]". Rather in The Iron Wall, he argued that the Jewish presence should be imposed by forming a strong defense that would demonstrate to the Arabs that the Jews could not be forced out of Palestine. However, while The Iron Wall expressed a comprehensive philosophy, its practical background and intent were much more limited. Jabotinsky wanted the British authorities to allow the Jews to form a separate defensive force under British supervision, to combat attacks such as the riots that had occurred in 1920 and 1921. The British refused, and the Zionist organization resigned themselves to the British decision, but Jabotinsky wanted to continue with the formation of such a force. Though the Haganah defensive underground was founded in 1920 by Jabotinsky, it didn't become a major project of the Zionist movement until after the riots of 1929. These riots, and not any intrinsic aspect of Zionist ideology, were the real trigger for the birth of militant Zionism as a political force, as well as the progressively more important role played by self-defense and military prowess in Zionist thought, action and society. Meanwhile the Arab and Jewish communities grew progressively apart. Arabs refused to participate in a Palestinian local government which gave equal representation to the Jewish minority. The British, nearly bankrupt after WW I, insisted that the mandate should be self-sufficient. Mandate services were paid for from taxes paid by the Jewish and Arab inhabitants of Palestine. Additional services were funded by philanthropists from abroad and from membership dues in various organizations. Zionist philanthropy and organization far-outstripped what Palestinian Arabs could provide. Neither Arabs nor Jews wanted integrated schools. Zionist groups funded religious, secular and labor-Zionist educational networks for Jewish children in Hebrew, but few comparable schools were set up for Arabs. The Zionists founded the Histadruth Labor federation to encompass Jewish workers, providing Hebrew education, medical care, worker-owned enterprises and cultural facilities as well as representation of labor rights. No comparable association was created by the more numerous Arabs of Palestine, though the Histadruth made some efforts to organize Arab labor beginning in 1927, and the Palestine Communist party attempted to represent both Jewish and Arab labor. As the conflict unfolded, attitudes hardened on both sides. Some Zionist factions called for expulsion or "transfer" of Arabs "voluntarily" or otherwise. Beginning with the Husseini clan led by Hajj Amin El Husseini, the Grand Mufti, different factions of Palestinian Arabs, successively allied themselves with Fascist Italy, Nazi Germany and, after WW II with communist countries. Arab rhetoric became increasingly colored by European anti-Semitism, and adopted many of the claims and ideas of Holocaust deniers such as Roger Garaudy as well as the anti-Zionist ideology of radical Jewish intellectuals. The conflict was intensified and complicated by the 1948 war. About 700,000 Palestinian Arabs fled or were expelled during the war, and Israel did not allow them to return. Many Palestinian refugees were settled in camps under miserable conditions, where they have remained for several generations. The Israeli point of view had in mind the recent convulsions of World War II, and the exchange of populations that occurred when India and Pakistan were created. Most Israelis believed the Palestinians became refugees through their own fault. Their exile was the result of the war which the Palestinians themselves had started by rejection of the UN partition plan, just as, for example, the Germans of Sudetensland, who helped instigate the German occupation of Czechoslovakia, were eventually banished as the result of their own mischief. For the Arabs of Palestine, their Nakba, or catastrophe, vindicated their fears that the Zionists were bent on dispossessing them. The British government increasingly understood that its promises to the Zionists and Mandate obligations were very unpopular in the Arab world. They split off a large part of the Palestine Mandate territory to form Transjordan and issued the Passfield White Paper that proposed limiting Jewish immigration to Palestine. The Passfield White Paper was quietly withdrawn under pressure from Zionists, from British public opinion and from the League of Nations. However, the British eventually did impose a limit on immigration. These policies turned the once-friendly British into antagonists of the Zionist movement. Labor Zionists and the Zionist Executive were in favor of moderate policies that would try to work around the British opposition to Zionism. A faction led by Ze'ev Jabotinsky believed in confronting the British and the Arabs, and if necessary, using force. In 1933, Jabotinsky split from the main Zionist movement and formed the Revisionist movement. In 1936, an Arab Revolt (The Great Uprising) broke out in Palestine, triggered by rising Jewish immigration and systematic agitation by extremists. In 1937, the British proposed tentatively to partition Palestine in the Peel report. This caused additional divisions in the Zionist movement. Some believed in a bi-national Jewish Arab state and objected to the idea, contained in the Peel recommendations, of transferring Arabs "voluntarily" out of the territory to be allotted to the Jewish state. The revisionists and religious Zionists, on the other hand, objected to giving up any part of the territory of Palestine. Subsequently the British issued the White Paper of 1939, severely limiting Jewish immigration. The Arab revolt and the reaction to it crystallized the Zionist ethos of self-defense and emphasis on military service. The Revisionists formed the Irgun underground army, which attacked British soldiers and administrators and perpetrated terror attacks against Arabs in retaliation for Arab attacks on Jews. Atrocities committed by the Arabs, as well as counter-terror by Jewish groups, inculcated in both Jews and Arabs the idea that any means at all may be used against the enemy, even though the Hagannah officially maintained a military ethic of "purity of arms" - forbidding needless violence. The Arab revolt and the Peel report also legitimized, to some extent, the idea of "transfer," and solidified and entrenched the idea that conflict between Arabs and Jews in Palestine was inevitable. The Zionists, attempting to rescue Jews from the Nazis, organized illegal immigration. The Revisionist Zionist movement began to organize immigration, both legal (with certificates) and illegal, in 1937, from Austria, and later from the free city of Danzig. At least 20,000 Jews were saved in this way. The Jewish agency opposed illegal immigration until the promulgation of the British White Paper of 1939, which stopped Jewish immigration. Thereafter, they founded and supported the Mossad l'aliya Bet ("B immigration institution") to bring immigrants from abroad. This operated between 1939 and 1942, when a tightened British blockade and stricter controls in occupied Europe made it impractical, and again between 1945 and 1948. Rickety boats full of refugees tried to reach Palestine. Additionally, there were private initiatives, an initiative by the Nazis to deport Jews and an initiative by the US to save European Jews. Many of the ships sank or were caught by the British or the Nazis and turned back, or shipped to Mauritius or other destinations for internment. The Patria (also called "Patra") contained immigrants offloaded from three other ships, for transshipment to the island of Mauritius. To prevent transshipment, the Haganah placed a small explosive charge on the ship on November 25, 1940. They thought the charge would damage the engines. Instead, the ship sank, and over 250 lives were lost. A few weeks later, the SS Bulgaria docked in Haifa with 350 Jewish refugees and was ordered to return to Bulgaria. The Bulgaria capsized in the Turkish straits, killing 280. The Struma, a vessel that had left Constanta in Rumania with about 769 refugees, got to Istanbul on December 16, 1941. There, it was forced to undergo repairs of its engine and leaking hull. The Turks would not grant the refugees sanctuary. The British would not approve transshipment to Mauritius or entry to Palestine. On February 24, 1942, the Turks ordered the Struma out of the harbor. It sank with the loss of 428 men, 269 women and 70 children. Apparently, it had been torpedoed by a Soviet submarine, either because it was mistaken for a Nazi ship, or more likely, because the Soviets had agreed to collaborate with the British in barring Jewish immigration. Illegal immigration continued until late in the war, apparently without the participation of the Mossad l'aliya Bet. The illegal immigrant Mefukure, organized with the help of the United States government, was sunk by a Soviet submarine in 1944. Despite the many setbacks, tens of thousands of Jews were saved by the illegal immigration. To circumvent British regulations against creating new settlements, the Zionists initiated the "stockade and tower" ("homa umigdal") program, that allowed overnight creation of a new "settlement," consisting of a wall and watch tower. Under the law, the British could not destroy such an 'established' settlement. Reports of Nazi atrocities became increasingly frequent and vivid. Despite the desperate need to find a haven for refugees, the doors of Palestine remained shut to Jewish immigration. The Zionist leadership met in the Biltmore Hotel in New York City in 1942 and declared that it supported the establishment of Palestine as a "Jewish Commonwealth." This was not simply a return to the Balfour declaration repudiated by the British White Paper, but rather a restatement of Zionist aims that went beyond the Balfour declaration, and a determination that the British were in principle, an enemy to be fought, rather than an ally. This was a defeat for the left-wing party of the Labor Zionists, Mapam, who wanted a bi-national Zionist state, and for Chaim Weizmann, who opposed confrontation with the British and favored partition. The Revisionists rejoined the Zionist movement, but were still called "dissidents" and did not merge their underground armies, the Irgun and the Lehi (also called the "Stern Gang") into the Hagannah defense organization of the mainstream Zionists. On November 6, 1944, members of the Lehi underground Eliyahu Hakim and Eliyahu Bet Zuri assassinated Lord Moyne in Cairo. Moyne, a known anti-Zionist, was in charge of carrying out the terms of the 1939 White Paper. The assassination turned Winston Churchill against the Zionists. The Jewish Agency and Zionist Executive believed that British and world reaction to the assassination of Lord Moyne could jeopardize cooperation after the war, that had been hinted at by the British, and might endanger the Jewish Yishuv if they came to be perceived as enemies of Britain and the allies. Therefore they embarked on a campaign against the Lehi and Irgun, known in Hebrew as the "Sezon" ("Season"). Members of the underground were to be ostracized. Leaders were caught by the Hagannah, interrogated and sometimes tortured, and about a thousand persons were turned over to the British. Following World War II, Britain continued to limit Jewish immigration to Palestine. The Zionist factions united and conducted an underground war against the British, as well as applying pressure on the British government through the United States. In June of 1947, the British rammed the Jewish illegal immigrant ship Exodus (formerly "President Warfield") on the high seas. They towed it to Haifa where it was the subject of extensive publicity, generating public sympathy for the Zionist cause. The passengers were eventually disembarked in Hamburg. The incident set world and particularly US opinion against the British, and caused the British to intern illegal immigrants thereafter in Cyprus, rather than attempting to return them to Europe. On November 29, 1947, the United Nations voted to partition Palestine into Jewish and Arab states. The Arabs did not accept the partition plan, and a war broke out. The state of Israel was established on May 15, 1948. Labor Zionism vs Revisionism - After independence, the Labor Zionist movement became, for many years, the leading political force in Israel. Mapai (Miflegeth Poalei Eretz Yisrael - the party of the workers of the land of Israel) party led by David Ben-Gurion and his successors held power continuously until 1977. The Zionist movement had split when Jabotinsky led the revisionists out of the Zionist organization in the 1930s. The Zionist executive was led by Labor Zionism under David Ben-Gurion. Revisionists and Labor Zionists had separate underground armies. Revisionists and Labor Zionists cooperated against British after World War II. However, the "Sezon" in 1944-45, the massacre perpetrated at Deir Yassin by the Revisionists in April 1948, and the subsequent sinking of the "Altalena" Irgun arms ship by the Israeli government, as well as numerous smaller incidents, helped to deepen the split between mainstream Labor Zionism and Revisionist Zionism. Begin, the leader of the Revisionist Zionists, was distrusted by Ben-Gurion and viewed a dangerous extremist. It was not until the 6-day war in 1967 in 1967 that revisionists were allowed to participate in a government coalition. Anti-Zionism is often defined as "opposition to the existence of Israel," but that definition is a historical distortion and probably detracts from understanding the nature of anti-Zionism and its diverse ideological roots. It is true that anti-Zionists are necessarily opposed to the existence of a Jewish state, but it is not the essence of their ideology. Anti-Zionism existed long before there was a Jewish state and long before the Zionist movement formally adopted the goal of founding an independent Jewish state in 1942. Anti-Zionists were and are opposed to Zionism for a variety of reasons. Assimilationist Jews denied that there is a "Jewish people." Marxists admitted that there is a separate Jewish group, but believed that it is undesirable to perpetuate its existence (see Marxist anti-Semitism A href="http://www.zionism-israel.com/his/The_Jewish_Bund.htm">The Jewish Bund and Anti-Zionism ). The bill of exchange is the real god of the Jew. His god is only an illusory bill of exchange. We recognize in Judaism, therefore, a general anti-social element of the present time, an element which through historical development -- to which in this harmful respect the Jews have zealously contributed. Arab nationalists are anti-Zionists because Zionism conflicted with their nationalism, though Feisal himself envisaged cooperation with the Zionists. Zionism was popular among Jewish people as a movement they might support with money or at political meetings. However, few, especially in Western countries, thought of coming to Palestine or Israel until the latter decades of the twentieth century, except when in danger of persecution. Palestine was too far, economically backward and dangerous to draw many immigrants. Nonetheless, non-Zionist groups like Alliance Israelite Universelle and many others helped Zionist efforts in Palestine and joined the Jewish Agency for Palestine. Jews who sought to assimilate in their own countries claimed that they were loyal citizens of a different faith, sometimes styling themselves "of the Mosaic persuasion" as did early reform Jews (see Reform Jewish anti-Zionism ) They felt that the Zionist movement and the concept of a "Jewish People" would raise questions about their own loyalty, and they resented the fact that Zionists often spoke as though they represented all Jews. This movement was particularly prevalent in Germany, where Jews were staunch supporters of German nationalism. Valuable insight into the prevailing ideologies of the time can be gained from Amos Elon's book, "The Pity of it All" (Henry Holt, 2002) which chronicles the tragic history of German Jewry. At one point, the reform Jewish movement went so far as to systematically remove all references to the Holy Land and Jerusalem from their liturgy. A large segment of ultraorthodox Jews were displeased by the secular ideas that dominated Zionism, and insisted that the rebuilding of Israel must await the coming of the messiah. In Europe, the agitation of assimilationist and ultraorthodox Jews helped to actively block Zionist rescue efforts in the 1930s, when it began to be apparent that Nazism would soon make Europe very dangerous for Jews. Jewish communists were and are opposed to Zionism because Marxism posited the disappearance of the Jews as a historic anomaly, once international atheistic communism triumphed over nationalist particularism, and religion, the opium of the people, died out. In the USSR, as part of his "nationalities" policy, which assimilated or murdered numerous national groups, Stalin tried to handle the Jewish problem by creating an autonomous Jewish republic in the wastelands of Birobidjan. This project was never supported very seriously and was later abandoned. Though the USSR supported the creation of the state of Israel, Stalin was opposed to Zionism inside Russia and the USSR suppressed Zionist activities and at times persecuted Jews as well as Zionists. Most religious Jews and the reform movement, initially anti-Zionist, reconciled themselves with Jewish state, after the Holocaust seemed to bear out the basic thesis that Jews required a homeland of their own and would not necessarily be safe even in the best circumstances, and after creation of Israel proved that Zionist aspirations could become a reality. Success has many fathers. Nonetheless, anti-Zionist ideologies and their representatives persist among religious groups such as the ultraorthodox Neturei Karta and writers such as Noam Chomsky. This ideological opposition to Zionism later dovetailed with the anti-Israel cold-war politics of the Soviet Union and the Arab antagonism to Israel, as well as with anti-Semitism. Retrospectively, communist ideologues pegged Zionism as a colonialist ideology bent on exploiting and dispossessing the native inhabitants of Palestine, and creating an apartheid colonialist fascist Jewish state. In 1975, a pro-Soviet and pro-Arab majority in the UN passed General Assembly Resolution 3397, branding Zionism as racism. The resolution was repealed in 1991, but similar sentiments were repeated at a conference of non-government organizations in Durban, South Africa in 2001. The rationale for this idea is that Zionism is a colonialist movement that assumes that the racial superiority of the Jews gives them the right to dispossess the Arabs of Palestine. However, Zionist ideology is not based on racial notions and didn't assume superiority of the Jews. Zionist theorists assumed that the Jews are socially inferior and "abnormal" because they did not have a national home. The "abnormal" Diaspora character of Jews would be corrected when the people returned to their own land, realized their right to self-determination and renewed their nation existence. Zionists believe that the Jewish right to the land is based on ancient historical links, not racial superiority. Some Zionists see the Arabs as usurpers, just as the Arabs see the Zionists as usurpers. As the conflict between Arab and Jew escalated, some Zionists favored voluntary or not so voluntary transfer to remove the Arabs, and others seem to have thought the Arabs could be wished away. However, Zionism as an ideology did not posit dispossession of the Arabs. It is undeniable that early Zionist leaders used the language and rhetoric of colonialism and established organizations with names like "The Jewish Colonial Trust." In part, this reflects the influence of the 19th century European cultural milieu, when colonialism was a perfectly acceptable concept. In part, it reflects efforts of Zionist leaders to sell leaders of the great powers on the idea of supporting a Jewish colonization scheme that would support German or British or French interests in the Middle East. The Socialist-Zionist movement certainly did not see themselves as colonialists and were opposed to colonialism and imperialism, nor did the USSR originally oppose Zionism on the basis that it is a colonialist movement. Anti-Semitic writers identify Zionism with the spurious program enunciated in the "Protocols of the Elders of Zion," a nineteenth century forgery of the Russian secret police, and insist that Zionists are intent on taking over the world.. A related notion, perhaps inspired by the writings of Najib Azouri, is that Zionism insists on expanding the Jewish state to the borders promised in the Old Testament - the Nile and Tigris Euphrates rivers. Though there are at present some religious and nationalist extremists in Israel who want such borders, Zionism never had any such program. Early Zionists did not always envision a national home in the Middle East, and "Palestine" did not exist as a political entity before 1922. The map of Zionist borders presented by Zionists to the Paris conference in 1919 was somewhat larger than modern Israel. It covered parts of what are now Jordan and Lebanon and Syria, ending just west of the Damascus-Hejaz railway. However, this optimistic (from the Zionist point of view) proposal was a bargaining position, had little to do with biblical promises, and did not reflect any deep seated ideology. The Zionist organization has continued to function after the establishment of the Jewish state. It has helped to bring millions of new immigrants to Israel, encourages the teaching of Hebrew and Jewish culture abroad, lobbies for Israel with the US and other governments, and rallies support to Israel in times of crisis. However, in Israel, "Zionism" became somewhat of a pejorative, associated with government propaganda, super-patriotism and regimentation. The Labor Zionist movement, that had founded the state, eventually found itself in a minority, replaced in large part by more militant religious Zionists and the Likud party, which inherited the mantle of revisionism, carried on by a Begin after the death of Ze'ev Jabotinsky. Zionism and the 6-day War- The 6-day war, which resulted in a dramatic victory for Israel, had a profound affect on the attitude of Jews in Israel and abroad to Zionism and Israel. The war and lightning victory taught many Arabs that Israel was here to stay, and in fact, it did the same for Jews. In Israel, it lifted the populace out of the doldrums of economic stagnation and frustration, and gave them renewed faith in the Zionist idea and the state. Abroad, the war had a more profound effect. The United States and Canada held the largest concentration of Jews outside the USSR. The vast majority of American Jews had looked upon Israel benignly and condescendingly as a refuge for persecuted Jews, and as a charitable cause that they would support with the same feelings of superiority that they supported their less fortunate relatives in Europe. Among secular American Jews, Zionism was regarded as the aberration of misfits and dreamers, somewhat as it had been at the beginning of the twentieth century. The state of Israel, had after-all been founded and Zionism had therefore "accomplished its purpose," they felt. They had seen the penniless immigrants, the wretched of the earth, arriving in the displaced-persons refuge called Israel with their pitiful bundles and strange clothing, coming off the gangplanks of ships in Haifa on newsreels. This was all very well for those poor unfortunates, who needed a place to live, but surely, it could have nothing to do with them or their lives, living in the United States or Canada and building their futures there. As an ideology, Zionism threatened their own sense of identity as Americans perhaps, or even worse, threatened to take their sons and daughters to a far-away land. All this changed rapidly in June of 1967. Israel became a source of pride for most Jews. They all wanted to be partners in this successful enterprise and to claim pride of ownership. Socialists came to volunteer in kibbutzim. Capitalists brought investment capital. Willing donors were found for the beautification and revitalization of Jerusalem. The NRP began to mobilize to settle and retain the conquered territories. Ultra-orthodox rabbis who did not recognize the Zionist state, nonetheless issued injunctions against returning any part of the "liberated" "holy land." Zionism and Occupation - For many people in Israel and abroad, "Zionism" came to imply support for the settlement of Jews in the territories occupied by Israel in the 6-day war. It assumed a very negative connotation for those who oppose the occupation. The word "Zionism" in the sense of support for settlers is used both by right wing Zionist extremists, and by anti-Zionists. Right wing Zionist extremists insist that withdrawal from the occupied territories will mean the "end of Zionism." Anti-Zionists insist that "expansionism" is part of Zionist ideology. Historically, this view does not seem to have ideological support, since "Greater Israel" was the ideology of the breakaway religious movement created after 1967, and was never the ideology of mainstream Zionism except perhaps for a few decades following the Six Day war. Messianism was part of proto-Zionism, but the Zionist movement was pragmatic in all that it said and did. Expansionism became popular as a result of historical accidents, and not because of ideology. The territory that might be allotted to the Jewish state shrank during the British mandate, creating a sort of irredentism. Rather than being friendly neighbors, it became apparent that the Arab countries would be hostile, generating a desire for "strategic depth" to protect against invasion. It was easy for Israeli governments to say they would return territories for peace, and at the same continue to build Greater Israel, since peace or anything approaching it appeared to be a remote abstraction. A part of the religious Zionist movement grafted itself on to the temporary realities created after the 6 day war, and evolved a radical Messianic ideology. They insisted that they and only they represent the "real" Zionism. A quiet coup had transformed Zionism. Unfortunately, a considerable part of the world took them at their word. The image of Zionism in the world was transformed from that of a progressive movement of liberation to a movement of fanatics who wanted to create a religious state and disenfranchise a native population. Disillusionment and Zionist Counter-Revolution - However, the dream of Greater Israel collided with hard realities. The Arabs of Palestine would soon be a majority between the river and the sea, making a democratic Jewish state impossible. Tens of thousands of IDF soldiers were needed to guard 8,000 settlers against Palestinian terrorism in Gaza. Israelis were confronted with images of Zionist soldiers destroying houses, uprooting trees and killing children as "collateral damage." This was not the Zionism of the school books. Messianism and wishful thinking aside, the state created by flesh and blood was faced with the facts of Palestinian demography, military necessity, humanitarian values and international commitments. Post-Zionism - Beginning in the 1980s, some Israeli historians and sociologists began to question facts about the official history of Israel and Zionism, as well as the Zionist ideology. They reasoned that Zionism had accomplished its purpose in creating the Jewish state, and that now it was time to move on. They posited that Israel and the Zionists had a large share of the blame for the animosity between Jews and Arabs, and had in fact, ignored the existence of the Arabs in Palestine and then dispossessed the Palestinians by force. This reasoning was supported by new histories, that talked frankly about less savory aspects of Israeli history that had been previously ignored. The new historians made a case that at least part of Zionism had always envisioned expulsion or transfer of the Arabs, and described massacres and expulsions which took place in 1948, often claiming that these were part of a deliberate policy. The historians claimed that these new facts were revealed by declassified archives. In fact, the most important facts supposedly "revealed" by the new historians were known to all Israelis who wanted to know them, though perhaps not in detail, and not presented in the particular way that new historians presented them. Facts can be interpreted in different ways. The ideas behind the facts, called by some "post-Zionism," do not necessarily form a coherent ideology and their practitioners do not generally see themselves as members of a movement or followers of a distinct philosophy. Some "post-Zionists" like Ilan Pappe are indistinguishable from anti-Zionists, while others, like Benny Morris, use the same facts to arrive at very different conclusions that might support a militant Zionist ideology. Post-Zionism attained a wide popularity for a while, but fell into eclipse after peace negotiations between Palestinians and Israel failed and violence flared up in September of 2000. Brief History of Israel and Palestine - Overview of Zionism and details of Palestinian and Israeli history. 1942: The Biltmore Program - The 1939 British White Paper had closed Palestine to Jewish immigration, trapping millions of Jews in Nazi occupied Europe. Zionist leaders met in the Biltmore Hotel in New York, and declared their support for a Jewish Commonwealth and renewed immigration, in open defiance of the British mandatory authorities. 1923: Vladimir Jabotinsky: The Iron Wall - This essay was published by the head of the Zionist Revisionist movement, Vladimir (Ze'ev) Jabotinsky in 1923. In reaction to riots that had occurred in 1920 and 1921. It called for an independent, legal Jewish defense force, a Jewish Legion in Palestine, which Jabotinsky referred to as an "Iron Wall." 1922: The British Mandate for Palestine - The League of Nations Mandate giving Great Britain control of Palestine for the purpose of making a Jewish National Home there. 1919: Statement of the Zionist Organization to the Paris Peace Conference - The Zionist organization presented this statement at the Paris peace conference, outlining the Zionist position regarding Palestine, and supporting the British proposal for a mandate that would create a Jewish national home, in line with the Balfour Declaration . The statement provides a great deal of background regarding the position of various Zionist groups and foreign governments, and gives proposed borders for the Palestine mandate as well as proposals for organization of the Palestine government. 1917: Balfour Declaration - The "letter" from Lord Balfour to Lord Rothschild, declaring that the British government "view with favor" the establishment of a Jewish National Home in Palestine. This was to be the basis of the League of Nations Mandate for Palestine, granted to Great Britain. 1897: Program of the First Zionist Congress - Theodore Herzl organized the first Zionist Congress in Basle, Switzerland in 1897. Prior to the Congress, Zionist activities had been initiated by several different groups such as Hovevei Zion (lovers of Zion) with no central direction or political program. The Basle Congress was the foundation of a mass Zionist movement. 1897: Max Nordau - Opening Address at the first Zionist congress. 1896: The Jewish State, by Theodore Herzl - This book became, essentially, the program of the Zionist movement and the embodiment of its common ideology. Complete downloadable source, with a historical preface. 1882: Auto-Emancipation by Leon Pinsker - This early Zionist pamphlet was written by Leon Pinsker after violent pogroms in Russia. 1799 - Napoleon's Proclamation of a Jewish State - In this stillborn proclamation, Napoleon offered the Jews a state in Palestine under French protection. This was the first of many such nineteenth century projects for restoration of the Jews in Palestine. Please note that we are NOT responsible for content of external links. Wikipedia article about Zionism - A comprehensive and fairly balanced article including the history of Zionism as well as links to specific topics and articles about anti-Zionism. Centenary of Zionism - Detailed History and biographies at the Israel Ministry of Information. Please feel free to copy all links on this page to your Web site, but do not copy the text of the Zionism article.